P&H bows are championed by many teachers as good student bows of consistent quality at a very reasonable price. Standard P&H fibreglass bows are strong and good quality, perfect for withstanding the rigours of student playing. The fibreglass stick is not affected by changes in humidity and is less likely to warp. 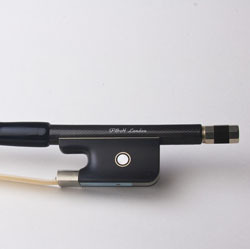 An ideal bow for students, P&H fibreglass bows are available in all sizes from 4/4 to 1/16 for violin, viola, cello and double bass and can be easily re-haired. P&H have researched and developed their own techniques and materials over the past 30 years and are recommended worldwide. P&H were one of the first companies to introduce and perfect fibreglass technology for bows. All P&H bows feature natural white horsehair and simulated whalebone lapping. They have the advantage of the unique easy rehairing system developed by P&H. P&H also produce coloured fibreglass bows that are perfect for jazzing up your playing or accessorizing your coloured violin. These resilient bows come in a range of six colours: black, blue, purple, red, pink and green. All P&H bows from Stentor feature natural white horsehair and simulated whalebone lapping. They have the advantage of the unique easy rehairing system developed by P&H. See details of how to rehair your bow yourself on the P&H website. The range also includes carbon composite bows for violin, viola, cello and bass that are some of the best value bows around.